Nobel Peace Prize Citation for Hong Kong students a triumph or travesty? Why a few US congressmen are on the wrong side of history in citing a young Hong Kong trio for the 2018 Nobel Peace Prize. For the city, is this a triumph or travesty? Signed by, among others, Marco Rubio the Republican senator who ran for president, this first ever nomination for a Hong Kong candidate cast a wide net with the inclusion of the movement as a force for good, immediately setting the Nobel committee on a potential collision course with China that took a less sanguine view of these events and continues to fear outbreaks of student recidivism. The letter goes on to highlight the "peaceful efforts to bring political reform and self-determination to Hong Kong and protect the autonomy and freedom" enshrined in the Sino-British Joint Declaration and the Basic Law that has seen frequent reinterpretations by China's highest legislative bodies, most visibly in the November 2016 decision by the Standing Committee of the National People's Congress to disqualify elected, but outlier, 'localist' lawmakers for having made a travesty of their oath taking ceremony. While some hawkish Chinese spokespersons – frequently trundled out to push rhetorical boundaries and gauge blowback – have rubbished the Sino-British deal as a "historical document that no longer has any realistic meaning," senior officials in charge of Hong Kong's affairs have been equally quick to assert that this simply means times and contexts have changed. They reaffirm the treaty is legally binding but add that any future 'One Country Two Systems' tweaks would be purely a domestic matter. This has been China's line throughout and any hint of outside meddling or UK interference is anathema. A high level of autonomy was conferred on the territory but not 'independence'. This is a word that makes Red China flush a deeper shade of crimson. Independence was never on the table at any time and no one suggested this – least of all the territory’s residents – when Margaret Thatcher and Deng Xiaoping sat down to tease out the contentious outlines of accord. This echoes Beijing’s thinking that “self-determination” is the thin end of the independence wedge. And if Hong Kong moves in this direction, what is there to stop Taiwan – by far the bigger prize – from doing the same? What Patten has consistently underscored is that all Hong Kong citizens remain vigilant and work at strengthening democracy and the rule of law. Demosisto, the student movement from which two of the nominees have been drawn, remains an unpredictable fringe group that while genuinely passionate about its beliefs has adopted an emotive and entirely untenable line of argument 20 years too late and out of touch with history. Hong Kong is very much a part of China and it has been returned, albeit with a 50-year guarantee on its cherished freedoms – dented but still intact – and way of life. This young group is imbued with courage and persistence yet lacks a clear focus, managing to alienate pretty much everyone in its pursuit of "democratic self-determination." On its website, the party states, "We push for the city's political and economic autonomy from the oppression of the Communist Party of China (CPC) and capitalist hegemony." This is running with the hare and hunting with the hounds, the rhetoric at once revolutionary Red Guard as well as Imperialist Running Dog. It has made an enemy of both Mainland party apparatchiks as well as Hong Kong's property tycoons. These are bright-eyed and passionate youngsters that must have a great say in the development of Hong Kong as, after all, they are the true inheritors of the future. But simply taking up cudgels against all manner of oppression, smacks more of teen angst and growing pains than mature leadership. 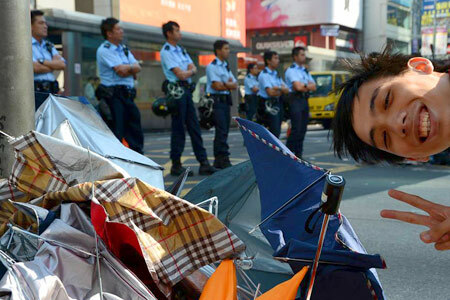 The fact of rebellion is not in itself worthy of a Nobel citation without the vision and forbearance of a structured, sensible, and sustained approach to strengthening democracy in Hong Kong that focuses on economic growth, opportunities – and housing – for the young and marginalized, quality education, and true emancipation from the city’s hobbling inward-looking approach to make the special administrative region a regional, if not global, leader. The Nobel Peace Prize has been awarded thus far to 131 Nobel Laureates (individuals and organizations), not always without controversy and political fallout. Their ranks have included the International Campaign to Abolish Nuclear Weapons (2017), gritty Pakistani child activist and Taliban assassination target Malala Yousafzai (2014), The European Union (2012), Chinese dissident Liu Xiaobo (2010), and former US President Barack Obama (2009). Nobel choices have sparked robust debate, none more so than Bob Dylan who received the award for literature in 2017 and then failed to show – for several months. Obama with his soaring oratory was almost a reflex choice. He had barely stepped into the office of the president when his name was announced and as events of the later Arab Spring demonstrated, American indecision, timidity, and missteps dashed any promise of lasting change, or peace. Against this backdrop of world changing events stand three proud individuals who have certainly fought tirelessly for Hong Kong. The question is what are they fighting for? In hindsight the Occupy ruckus, which began as a call for universal suffrage, was all steam and no electricity. The movement quickly lost focus and leadership as endless grievances – not least against the tin-eared Chief Executive C Y Leung – poured in creating an indecipherable emotional stew. The city was held to ransom for almost three months. Nothing was achieved and many alienated. It would be wise for Demosisto as well as the proposing US congressmen to sit down and reread their history. Perhaps this unusual spotlight will finally enable the city’s students to examine their ‘struggle’ and to channel their energies into securing democracy as well as protecting Hong Kong’s institutions – the rule of law, a free press, and personal freedoms unavailable in many cities around Asia. This would be applauded by all and constitute a far bigger prize. Independence fell through the trapdoors of history, never to return. This is as true now as it was in 1997. From what I gather the students are championing democracy. There is nothing wrong with that. I do agree that independence is a lost cause. Very well written summation of the events of 2014 that I had the opportunity to witness briefly.